From Business Highway 71 in Butler, go east on H Highway 6.75 miles to VV Highway, turn left (north) on VV and go 2 miles to the end of the blacktop. Cemetery is on the southeast corner of the intersection. duplicate of above Fry stone and beside it - lying face down. Just down Seelinger Road where VV Highway crosses, sits Elizabeth Chapel Cemetery. It has been nearly a century since the last known person was buried in the Elizabeth Chapel churchyard cemetery. It has been over 70 years since the sound of a congregation singing hymns or a minister preaching the Word has been heard there. The church has been gone nearly 60 years The churchyard had become tangled with brush, fallen trees and leaning tombstones. It wasn’t always this way. Once, Elizabeth Chapel served the settlers of Summit Township both as a church and as a community center in Bates County’s only township without a town. In the early 1880’s, a group of Summit township residents gathered together in worship. They met first in the Redmond school house. The congregation grew rapidly and it was decided that a proper church should be built. In September, 1884, church members began construction of Elizabeth Chapel. 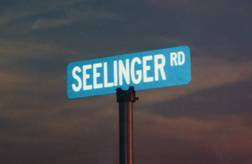 The site chosen was the southwest corner of the intersection of what is now the north end of VV Highway and Seelinger Road, about 8 miles northeast of Butler. This was just about three-fourths of a mile west of the Redmond School. Elizabeth Chapel was started in 1884 and was dedicated early in 1885. The Summit township neighborhood was prosperous and devoted to the church. So, in point of attendance and in work accomplished, Elizabeth Chapel ranked with the city churches in entertaining conventions, teaching music and dramatics and enjoying lecture courses and many other benefits. R.I. Hukel was elected clerk at the time the church was first organized and held the office until the time of his death. The first preacher was James Hukel. The Hukel family were early settlers in Bates County. John Seelinger was elected trustee and served until the church was disbanded. Other early ministers included W. W. Warren of Osceola, Henry Price, Schell City; George Webb, Butler and R. R. coffee, Cass County. In 1904, a young man from Kansas City, Henry W. Hunter, came to Bates County to recuperate from an illness. He felt a calling and became an ordained minister and served Elizabeth Chapel until the end. But with time, motor travel, consolidated schools and businesses centralizing in the larger towns, Elizabeth Chapel’s congregation dwindled. By the early 1920’s their numbers were so small that the church was reluctantly closed. The late 20’s and early 30’s brought offers to buy the abandoned church building, but there was no one left to consider the offers. The church remained empty and fell into disrepair. The tall brick chimney was the first to fall. The windows were broken out and neighborhood children played hide and seek among the overturned pews. On July 10, 1941 a heavy rainstorm swept across the county bringing down the remains of the old church to a pile of rubble. Only the graveyard remained. The last recorded burial was Caroline Sells, wife of Spencer Sells, who died August 2, 1907 at the age of 69. 17 names are known of the individuals buried there. In the late 1940‘s, Mrs. (Maude) Chester A. A. Sleeth, daughter of trustee John Seelinger, spearheaded a campaign to place a monument in the graveyard markin g the site of Elizabeth Chapel. The memorial was erected by Kling Memorials and remains today. 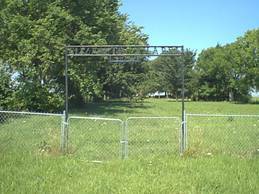 Over the years, generous neighbors and clubs have mowed the cemetery and tried to keep it from becoming completely overgrown. 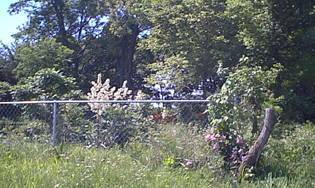 Wild roses climbed the tombstones, poison ivy was rampant and shrub dogwood grew where the church once stood. But now, this has all changed. As part of the restoration program at Poplar Heights Farm, where church trustee John Seelinger lived, Elizabeth Chapel Cemetery is also being restored and maintained. A new fence now encloses the cemetery and church grounds. The brush has cleared and grass seed sown. An old style iron sign reading “Elizabeth Chapel - 1884” has erected. The last project will be to clean and reset the tombstones. Poplar Heights Farm maintains the cemetery grounds. 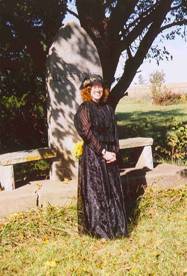 “Those people resting at Elizabeth Chapel cemetery helped settle Bates County. They faced adversities and difficulties that we today cannot imagine. The Chapel became a center point in their lives and in their deaths. We owe them the right to rest in dignity,” said Brian Phillips, great-great-grand son of John Seelinger. Phillips is director of the restoration programs at Poplar Heights Farm and Elizabeth Chapel Cemetery for Marais des Cygnes Society. 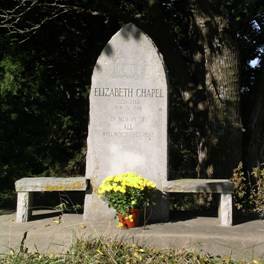 On October 15, 2004, on the 120th anniversary of the building of Elizabeth Chapel, Poplar Heights Farm held a Rededication Service at the Elizabeth Chapel Cemetery. The Chapel had been a Christian Church and local Christian minister, Rev. Brent Haworth conducted the moving service. Celia Casolari, in period dress, represented Elizabeth Redmond for whom the church was named. She spoke, as Elizabeth, telling of her life and death. Former chapel parishners, relatives of those interred in the cemetery, neighbors and friends attended. Deborah Casolari, Marais des Cygnes Society director, led all in singing Amazing Grace. A box supper will be given at Elizabeth Chapel Friday night, April 2. We shall have present the mandolin club and Lone Oak band.will furnish some good music. Mr. Ed Potts’ little twin boys will sing a duette. It is worth more than 15c to hear them. We will also have a very lengthy literary programme. You will miss a good time if you are not there. Well filled boxes will be sold for only 15cts apiece. The proceeds are for the benefit of the Christian endeavor. Everybody invited.